Along with Bill Gates, Microsoft may be hailing the departure of a mindset and a culture that's fixated on extending its hold on the pipeline of information. At least that's how Steve Ballmer presented his company yesterday. Microsoft CEO Steve Ballmer in front of a projection of what's supposed to be the future, some of which he admitted to be "an inventory of what Microsoft has shown thus far." LOS ANGELES (BetaNews) - The post-Gates era of Microsoft is already showing signs of a material difference in the company's objectives and its core message. During yesterday's keynote address for the company's single-day "Heroes Happen Here" launch event, CEO Steve Ballmer presented fewer of the meandering metaphors and enumerated participles that spawn, most obviously, from Bill Gates' mode of speech. And gone was any hint of the almost apelike stance Ballmer took during his famous "Developers, developers, developers" rant of years ago -- though it still managed to populate the screens of show visitors even yesterday, thanks to YouTube. Instead, having been introduced by no less than Tom Brokaw, Ballmer took the stage in a dark knit suit minus the tie, and offered a more complex, nuanced message. Sure, many of the typical Microsoft-isms did pop up, including one new phrase that truly is a gem for the ages. But the main message yesterday was one of a company that shares the travails of the IT worker and the developer. 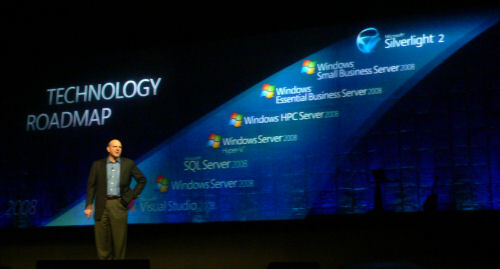 Though Microsoft's marketing team had originally sculpted its "Heroes" motif around Windows Server 2008, Visual Studio 2008, and SQL Server 2008 -- the three products being celebrated yesterday, even if only one of them was actually being "launched" -- the keynote literally sounded as though at some point, Ballmer or Microsoft scrapped the original program and started over, this time with a focus on the customer as hero...and not the tragic hero at that. Though Ballmer continued Microsoft's fourfold message that, at times, repeated the phrase, "focus on enabling agility," it was obviously tailored yesterday to sound more personal, more direct, less like something hovering thousands of feet over the Microsoft corporate campus. "You really want us and the other participants, other vendors in our industry, to help you achieve agility and manage complexity," Ballmer remarked, listing the reformed #1 item on his company's four-fold agenda. "How can you do more with less? That's a marketing theme we used a few years ago. But it really represents in some fundamental way a lot of what we're hearing from you." The number two point was also modified and brought down to earth somewhat, now being called "protecting access to IT systems" as opposed to just "greater security." The idea here, the CEO stated, is that the need for information workers to collaborate electronically, by its very nature, expands the pipeline between them. Thus there need to be more methods for controlling access through that pipeline, and Ballmer managed to say this without any references to barricades or firewalls, and just one reference to "the bad guys." Point three has become a subtle admission on Microsoft's part: Businesses cannot, and in the long run will not, see intrinsic business value in these IT tools that the company was supposedly celebrating yesterday. The reason is because business goals are facilitated by the applications those tools create and facilitate. In that important respect, Microsoft may for the first time be receding from the spotlight in this department, sublimating its trademark and its marketing message ever so slightly in order to better position itself for a world where Windows will never be given the full credit for business' success. "At the end of the day, business value comes from applications," stated Ballmer, to which the crowd responded with an audible, "Yes!" "It's the new field service system, the new customer billing system, the new system that helps the advertising agency and the marketing department collaborate more quickly, to get insights about how customers can do next-generation creative," he continued, once again invoking "creative" as a noun. "It requires a real collaboration between the developers who build these solutions and the people who actually have to deploy and manage them." That gap can and must be bridged, among other reasons, so that management and executives can better appreciate IT workers for who they are and the vital roles they play in their organizations. That led to Ballmer's #4 point, that IT workers need access to the same types of tools that managers and executives have to evaluate their work from a perspective of its contribution to the business. From here, CEO Ballmer proceeded to a four-stage model of the evolution of the IT shop in the enterprise, from one that mainly reacts to failures and crises to one that innovates. In a way, Ballmer admitted, companies like Microsoft had in the past actually facilitated the mindset of responding to crises and failures, by producing tools that helped organizations to better sound the alarm. But that approach has to change if businesses expect to evolve. "[In] the basic IT shop, IT is a cost center," Ballmer explained. "A lot of what IT is about is putting out forest fires. Manual processes, minimal central control, disparate systems, few standards. Companies gradually have been trying to professionalize, to get more dynamic and more agile, then they start to standardize. More automation, still a reactive characteristic, certainly to the businesses, but a definite improvement in a rationalized environment. There are tools that we can give you today to progress through these stages. Policy is pretty pro-active." But a problem arises when software empower the user to such a degree, he continued, that information flows at such a rapid pace that the lack of control of that information leads to a breakdown in the organization. It's the dark side of empowerment, and Microsoft appears to be facing it. Here, the organizer's of Microsoft's gala launch event on Wednesday faced a fundamental logistical problem: The keynote speech was to be held at the Nokia Theater, but the reception and events afterwards took place in a building 300 yards away. 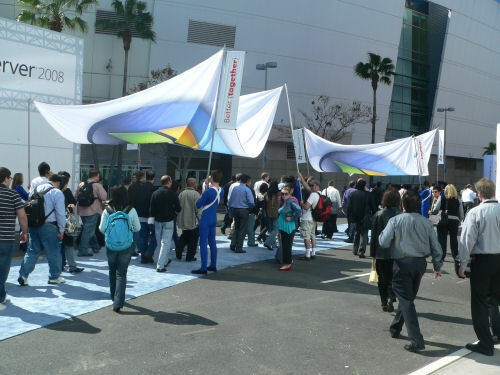 To herd attendees from one venue to the next, young "Olympians" in skintight, one-piece blue body suits were hired to hoist flags from holsters attached to their bodies...in a rather unusual location. This photo clearly shows where one pole-holder apparently left the scene, and asked an attendee if he wouldn't mind holding this pole for him. Whether he returned later is unknown.